A TEENAGER from Camden has been chosen to help carry the Beijing Olympic flame across London as part of a worldwide torch relay next week. 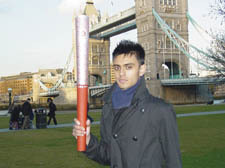 Mohammed Azharul Hussain, a 17-year-old pupil from South Camden Community School who lives in Harrington Square, will share the honour of carrying the torch with celebrities, athletes and Olympic hopefuls, including double gold medal winner Dame Kelly Holmes and broadcaster Trevor McDonald. The torch will begin its London tour in Wembley before being carried through the West End and then on to Greenwich, where there will be a performance by the Sugababes. The global relay incorporates 22 cities on five continents and every province in China.